NFL Commissioner Roger Goodell claims there's no backlash from teams for Colin Kaepernick's protests. ENGLEWOOD, Colo. — NFL Commissioner Roger Goodell says teams aren’t blackballing Colin Kaepernick for kneeling during the national anthem last year. “No, teams make decisions (based) on what’s in the best interest of their team … and they make those decisions individually,” Goodell said Thursday following his appearance at a forum with about 200 fans at the Denver Broncos’ indoor practice facility. 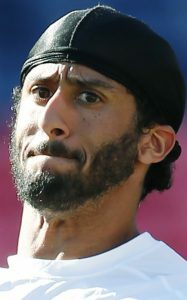 Kaepernick, who opted out of his contract with the 49ers on March 3, has drawn interest from Seattle and Baltimore but remains unemployed a year after throwing for 16 touchdowns and four interceptions in 11 games. Several teams have signed lesser backups without giving Kaepernick a call. Goodell demurred when asked if he thought Kaepernick should be in the league based strictly on his talent. Kaepernick drew significant backlash last year after kneeling during the national anthem and saying he could not show pride in a flag of a country that he believes oppresses blacks and other minorities. During the forum, one fan suggested Kaepernick’s prolonged protest was the reason for the decline in the NFL’s television ratings last year. Goodell used Broncos linebacker Brandon Marshall as a good example. Marshall, who was a teammate of Kaepernick’s at Nevada, knelt for seven games, then ended his protest after Denver police changed their use-of-force policy. • Just like the public’s view of gambling has evolved, so, too, has its view of marijuana to fight pain, but the issue is a medical one. • He doesn’t believe the restrictions on padded practices during training camp and the regular season have eroded the overall quality of play.